A tragic landmark in the civil rights movement, the Lorraine Motel in Memphis is best known for what occurred there on April 4, 1968. As he stood on the balcony of Room 306, Dr. Martin Luther King Jr. was assassinated, ending a golden age of nonviolent resistance, and sparking riots in more than one hundred cities. Formerly a seedy, segregated motel, and prior to that a brothel, the motel quickly achieved the status of national shrine. The motel attracts a variety of pilgrims—white politicians seeking photo ops, aging civil rights leaders, New Age musicians, and visitors to its current incarnation, the National Civil Rights Museum. 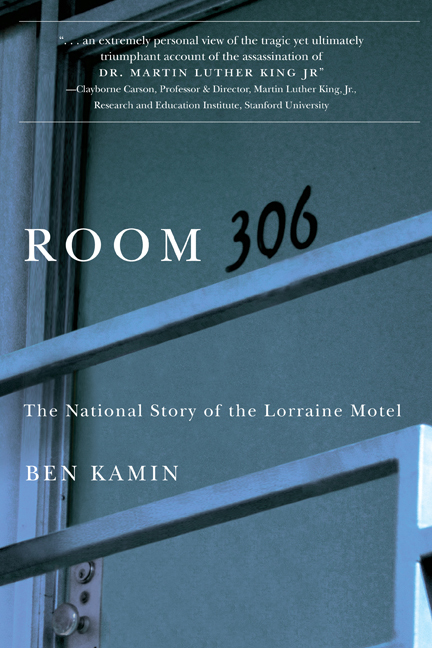 A moving and emotional account that comprises a panorama of voices, Room 306 is an important oral history unlike any other. Ben Kamin is a nationally known clergyman, teacher, counselor, and author of eight books on human values, civil rights, and spirituality.